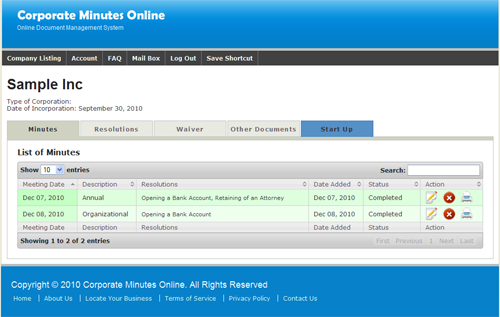 Every business needs a system that allows them to use their time in the most efficient way possible. 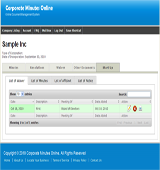 Corporate Minutes Online provides you with an online user friendly system that will help you create the business documents you need at a less time and low cost. 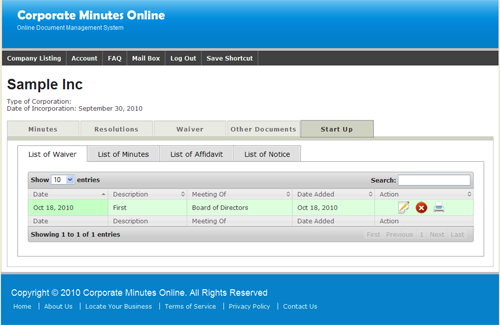 A meeting can be an organizational or special. 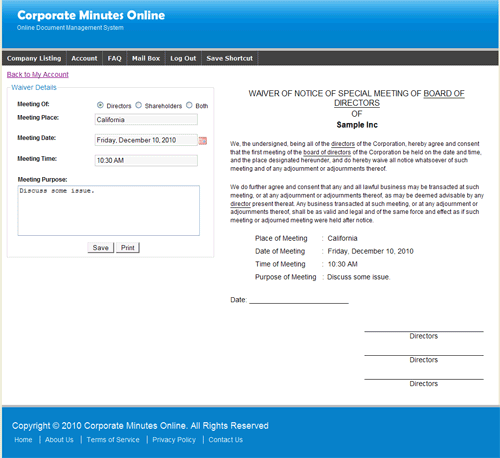 Before a meeting is held, notice must be distributed so a Notice of a Meeting is prepared. 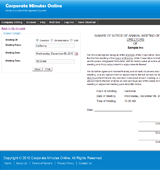 There are circumstances, however, where either the company is unable to provide notice or the particulars of the meeting have changed. 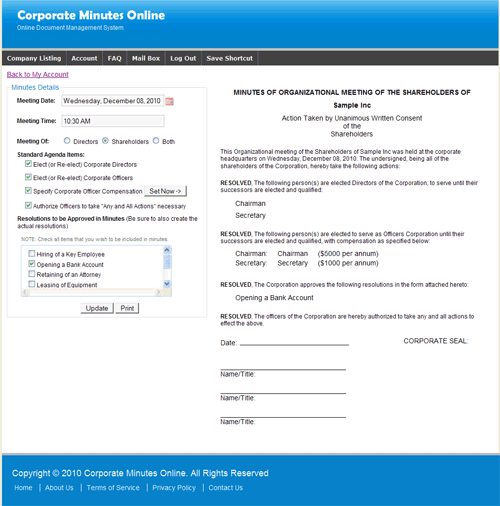 In that situation, a Waiver of Notice of the Meeting may be used. 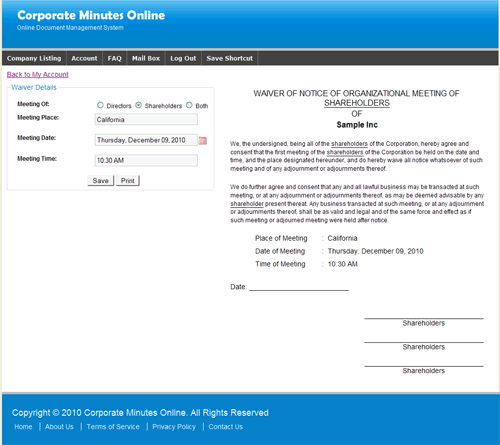 This document simply allows the directors to waive the notice requirements so that the meeting may proceed as planned. 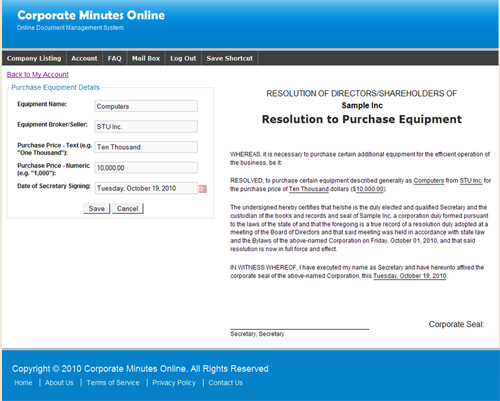 The board must hold a meeting before any resolution is made. 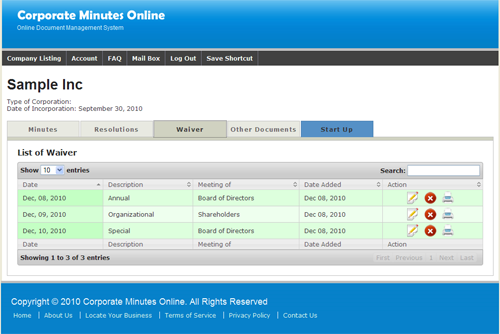 Organizational Meeting is the initial meeting where the formation of the corporation is completed. 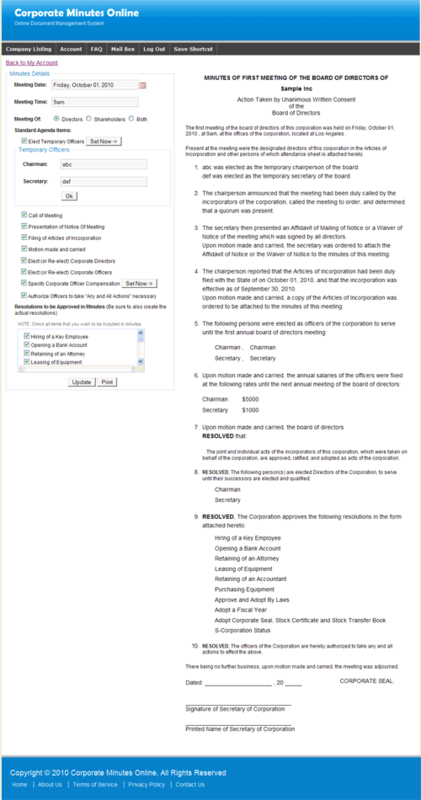 At the organizational meeting a number of initial tasks are completed such as: the articles of incorporation are ratified, the initial shares are issued, officers are elected, bylaws approved, and a resolution authorizing the opening of bank accounts is passed. 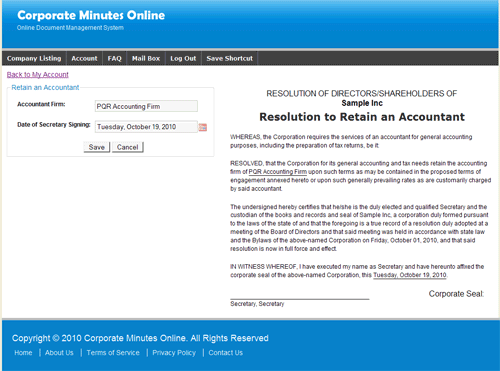 If the initial directors are named in the articles of incorporation, they can hold the organizational meeting. 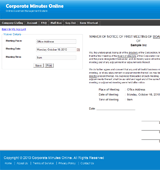 If they are not named, then the organizational meeting is held by the incorporator. 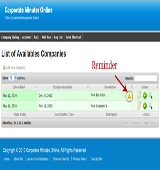 An annual meeting is held to appoint the officers of the corporation for the coming year, decide if dividends will be declared for the year, and make any other annual decisions regarding the financial matters of the business. 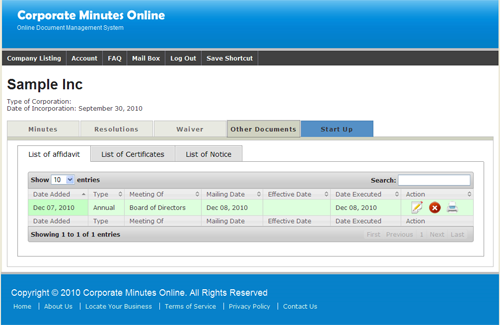 Special Meeting is a meeting that can be called by the directors or officers at any time. 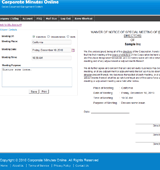 Typically, special meetings are called when the directors want to hire or fire officers, or when there is a need to address some unique circumstance that has arisen and which cannot wait until the next annual directors meeting. 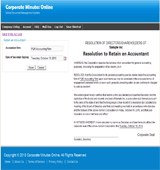 The Minutes of the Meeting serves as a formal record of the meetings’ proceedings and of the resolutions adopted by the board of directors of a corporation. 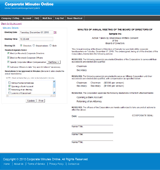 A resolution is used by the Board to draw attention to a single act or Board decision, for example, to approve or adopt a change to a set of rules, new program, new contract, etc. 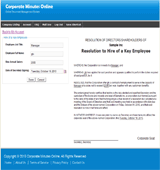 Resolutions are approved in a board meeting and should be included in the minutes of the board meeting. 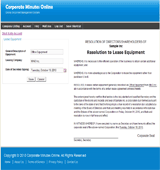 If actions were taken in the past year (for instance, opened a bank account or sign a new lease for equipment) you should ratify those decisions formally with a corporate resolution. 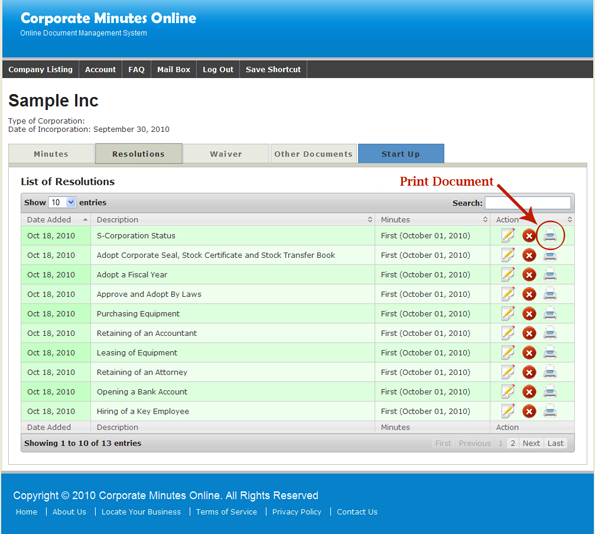 Keeping your business documents organized is essential to make sure that any business stays on track. Business documents have to be kept in a place that is secure and accessible for the business to make sure that it is readily available when needed. 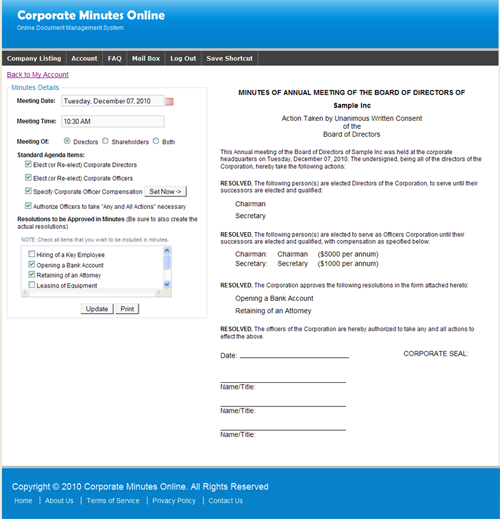 Corporate Minutes Online can help your business in managing your records by keeping it in a secured place, easily accessible and making it readily available to print when needed. 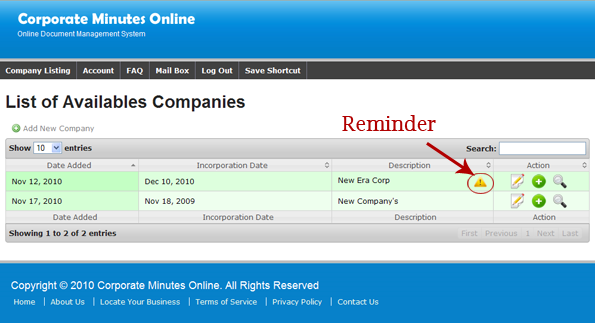 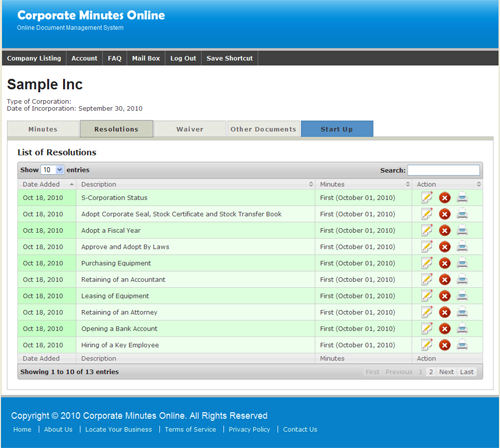 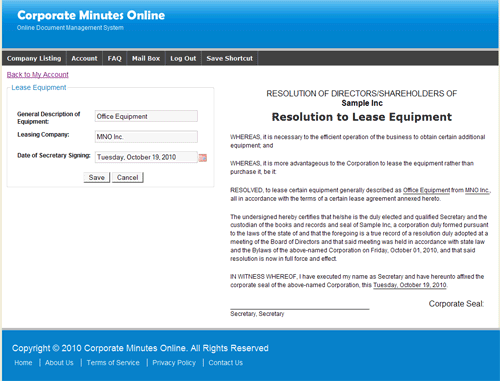 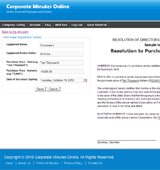 Corporate Minutes Online helps you control and reduce costs and issues involved in record management. 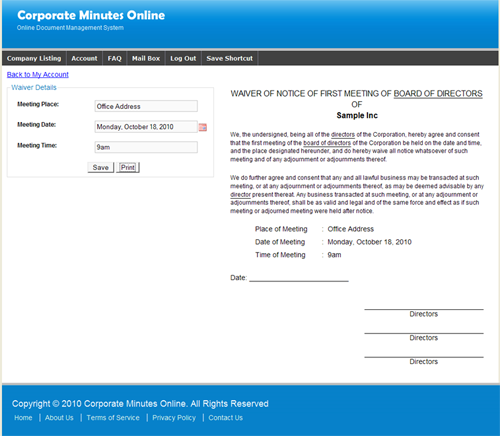 Corporate Minutes Online keeps and manages all documents you have created in our system making it readily available whenever you need it. 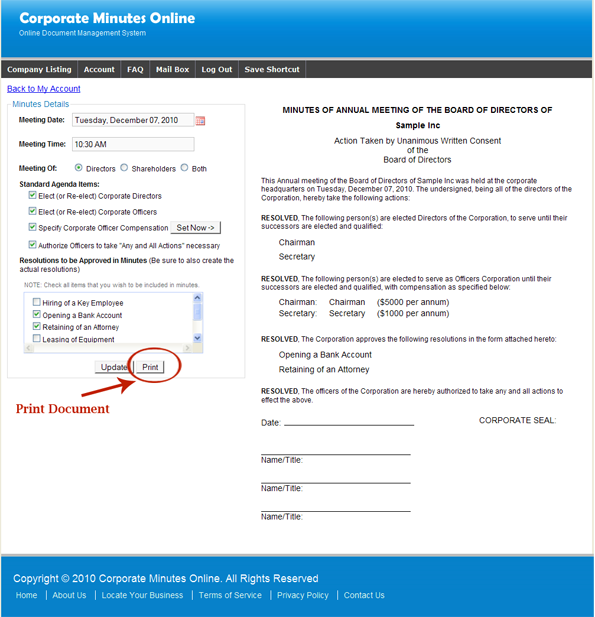 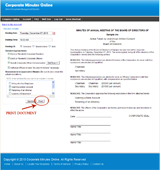 Corporate Minutes Online provides you with a printing feature and with just one click your chosen business document can be printed and ready to use. 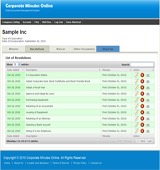 (d) corporate legal state filings.